The new for 2018 prehistoric animal models from Safari Ltd are now in stock at Everything Dinosaur. What a lovely surprise for Christmas, all the new Safari Ltd Wild Safari Prehistoric World prehistoric animals are available from Everything Dinosaur and we even have the prehistoric horse (Przewalski’s horse), in stock for good measure. 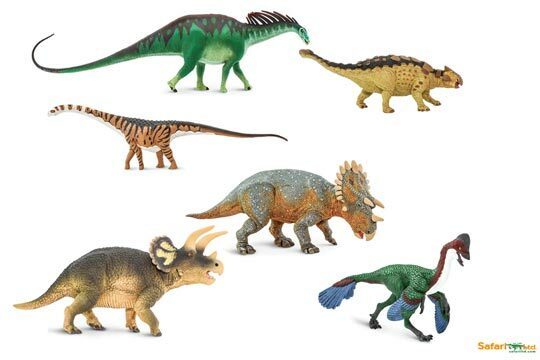 New prehistoric animal models in stock at Everything Dinosaur. The list of new prehistoric animal models is most impressive, there is an Amargasaurus, an American Mastodon, Uintatherium, Daeodon, Ankylosaurus, Dimetrodon, Macrauchenia, the North American caenagnathid Anzu wyliei and a Malawisaurus. In addition, Safari Ltd have introduced Hyaenodon gigas, two horned dinosaurs Regaliceratops and Triceratops. There is also a Megacerops and we have added the Safari Ltd Winners Circle Przewalski’s horse. Since the retirement of the Carnegie Collectibles range in 2015, Safari Ltd have set about replacing the dinosaurs that featured in that scale model series. Hence the introduction of Amargasaurus and Ankylosaurus. It is great to see a new representation of the Pelycosaur Dimetrodon introduced as well. The 2018 dinosaurs also feature some new dinosaurs, modelled by Safari Ltd for the first time. Malawisaurus, Regaliceratops and the feathered Anzu wyliei also join the range. The new for 2018 dinosaurs from Safari Ltd.
As with all the named dinosaur and prehistoric animal models that we sell, each model is supplied with its own fact sheet. Our team members have had to research and write three new fact sheets to accommodate these models, namely fact sheets for Anzu wyliei, the American Mastodon and the African Sauropod Malawisaurus. A scale drawing of Anzu wyliei. The models are very well made and superbly painted. Everything Dinosaur congratulates Safari Ltd on the quality of these new introductions. They also deserve praise for creating such a diverse range of dinosaurs and mammals, plus of course the Dimetrodon, that is more closely related to mammals than it is to the Dinosauria. It is interesting to note that there is only one Theropod in the fourteen replicas that Everything Dinosaur has brought into the warehouse. The one Theropod is Anzu wyliei and it is not typical of the Theropoda. For a start it is edentulous (toothless) and it possessed a beak. The most striking feature of this dinosaur nicknamed “the chicken from Hell”, as all the A. wyliei fossil material has come from exposures that represent the famous Hell Creek Formation, is the bizarre rounded crest on the top of the head. The crest superficially resembles the crest on an extant Cassowary (Casuarius genus).